Too many of our favorite shirts, pants and dresses have fallen victim to spills, overzealous eating, and other accidents. 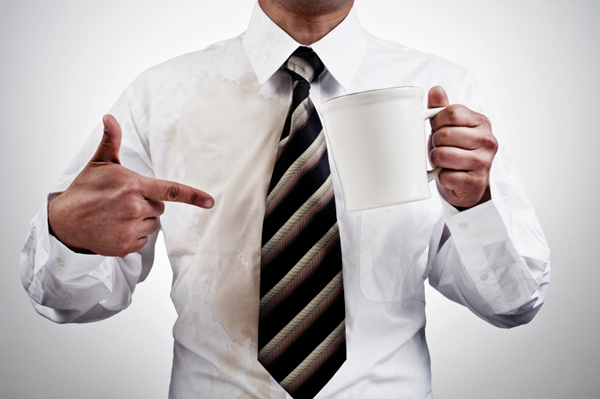 Don’t let stains have the upper hand! Meet the 7 nastiest stain offenders and discover how to remove them for good! Remember to treat stains as quickly as possible. You have a better chance of removing them when they’re still fresh. Before using any stain removing products, be sure to test a small portion of the affected clothing for colorfastness. This way, you won’t be treating the stain at the expense of your lovely garment. Now, go fight those stains! If the fabric is dry clean only, use a dry cleaning solvent. If the fabric is washable, pretreat the stain with a laundry stain remover, then wash it per your garment’s care instructions. If you’re looking for a convenient at home remedy, saturate the affected garment with club soda, then wash.
First, wait for the chocolate to harden. Then, use a spoon or butter knife to gently remove the chocolate from the affected garment. Next, use a dry cleaning solvent for washable and dry clean only fabrics. Place a white rag beneath the stain, then apply the solution directly on the chocolate. Blot the stain with your finger, then rinse with warm water and repeat if necessary. Your best bet is to immediately treat the stain with a stain stick. This enzyme-rich product helps prevent grass stains from setting into the fabric. Simply apply the stick to the grass stain, then blot into the stain. Wait anywhere from one minute to one week before washing. Treat blood stains as quickly as possible. Start by flushing cold water over the stain and blotting it with your fingertips. If this doesn’t do the trick, use a dry cleaning solvent for washable and dry clean only fabrics. You also may use a laundry stain remover for washable fabrics. For an easy at home remedy, soak the garment in a mixture of ammonia and water for about 20 minutes, then rinse. Quickly saturate the stain with a laundry stain remover. Then, wash it in water as warm as the fabric allows. If you don’t have a stain remover handy, try using a liquid dishwashing detergent instead. First, apply an absorbent powder (like cornstarch, baking soda, or baby powder) to the grease stain and let it sit. If grease still remains, use a dry cleaning solvent for both washable and dry clean only fabrics. While treating, don’t forget to place an absorbent white cloth beneath the stain. Use hairspray! Place a clean rag underneath the stain and spray the ink until the fabric is saturated. Let it soak for several seconds and blot with another clean rag. Repeat until the ink stain is gone and launder as usual immediately afterward.